ASHEVILLE, North Carolina, January 8, 2013 (ENS) – The year 2012 was warmest year for the continental United States since record keeping began 107 years ago, the U.S. National Climatic Data Center announced today. The U.S. Climate Extremes Index indicated that 2012 was the second most extreme year on record for the nation, marked by historic drought, wildfires, hurricanes and storms. The index, which evaluates extremes in temperature and precipitation, as well as landfalling tropical cyclones, was nearly twice the average value and second only to 1998. The year consisted of a record warm spring, second warmest summer, fourth warmest winter and a warmer-than-average autumn, said the Center, a division of the U.S. Department of Commerce. 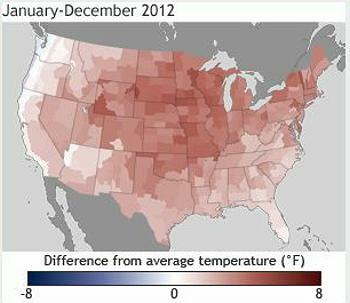 The 2011/12 winter season was nearly non-existent for much of the eastern half of the nation. The three months from December 2011 through February 2012 were marked by near-record warmth across the U.S.-Canada border, the Midwest, Mid-Atlantic, and Northeast, limiting seasonal snowfall there. Many locations had near-record low snowfall totals for the winter season. Early spring brought much of the same, when the continental U.S. had its warmest March on record, with a monthly temperature 8.6 degrees Fahrenheit above average. The average temperature for 2012 was 55.3 degrees Fahrenheit – 3.2 degrees F above the 20th century average, and 1.0 degrees F above 1998, the previous warmest year. Last year was the 15th driest year on record for the nation, with an average precipitation total of 26.57 inches, 2.57 inches below average. At its peak in July, the drought of 2012 parched 61 percent of the nation, with the Mountain West, Great Plains, and Midwest experiencing the most intense drought conditions. The dry conditions allowed wildfires to spread across the West, charring 9.2 million acres – the third highest burned area on record. Tropical cyclone activity across the North Atlantic in 2012 as above-average with 19 named storms, 10 hurricanes, and one major hurricane – Category 3 or stronger. This is the third consecutive North Atlantic tropical cyclone season with 19 named storms and ties with as the third most active season for the basin. Hurricanes Isaac and Sandy made landfall along the U.S. coast during 2012. Isaac brought large storm surge and torrential rains to the Gulf Coast. 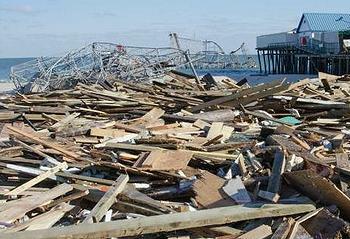 Sandy caused much damage in 24 states across the Northeast and Appalachia. Eight million homes lost power and 131 fatalities were reported. There were 11 disasters that reached the $1 billion threshold in losses, including hurricanes Sandy and Isaac, and tornado outbreaks experienced in the Great Plains, Texas and Southeast/Ohio Valley. Tornado activity as a whole, however, was below average. Drought conditions continued to plague Hawaii during 2012. At the beginning of 2012, 47.4 percent of the state was experiencing moderate-to-exceptional drought, according to the U.S. Drought Monitor. By the end of the year, the percent area experiencing moderate-to-exceptional drought expanded to 63.3 percent of the state. Only Alaska was spared. Alaska was cooler and slightly wetter than average during 2012. The year began very cold for the state with a January temperature 14.0 degrees F below the 1971-2000 average. Each subsequent season was also cooler than average, resulting in an annual temperature 2.3 degrees F below average. Much of 2012 was also wetter than average, and the annual precipitation total was 9.2 percent above average. Back in the Lower 48, every state had an above-average annual temperature for 2012. 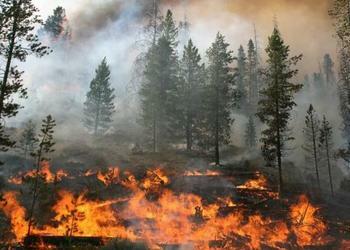 Nineteen states had a record warm year and 26 other states had one of their 10 warmest years. “We need to focus now on what we must do to address climate change so that we can protect our people, local communities, and the nation’s economy,” Boxer said. “Unfortunately, this won’t be the last time we break records like this,” said Angela Anderson, the director of the Climate and Energy Program at the Union of Concerned Scientists. Many U.S. cities saw their temperature records broken. “2012 has been a wake-up call for local governments,” said Michael Schmitz, executive director for the association of cities and local governments dedicated to sustainable development known as ICLEI USA. “Today’s news underscores the need for America’s cities and counties to prepare for a new reality of extreme weather that puts at risk their citizens, infrastructure, natural resources, local businesses and other economic assets,” said Schmitz. Many cities are taking action to protect themselves from worsening climate change without waiting for the federal government to act. For instance, the nation’s capital, Washington, DC, experienced the most extreme heat wave on record in July 2012. Persistent drought continued throughout the year, with rainfall at 8” below normal. On June 29, a powerful derecho – a lengthy, straight-line windstorm with a fast-moving band of severe thunderstorms – brought winds from 60 to 80 mph, downed hundreds of trees, and left more than one million people in the DC area without power. 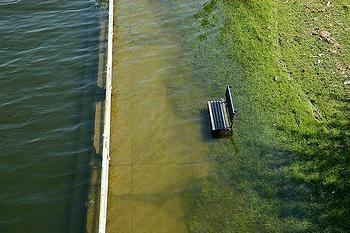 To protect the city core from flooding, Washington is having a flood gate constructed on the National Mall. In addition, the Capitol District had installed 1.5 million square feet of green roofs by the end of 2012 due to requirements and incentives to encourage green roofs, which cool the city and slow stormwater runoff. The tree canopy in the district grew by 818 acres between 2006 and 2011, a 2.1 percent increase which helps provide shape, cool the city, and reduce energy use. To reduce greenhouse gas emissions and increase energy security, the District purchases so much renewable energy that it was recognized in 2011, and again in 2012, as the #1 U.S. EPA Green Power Community.